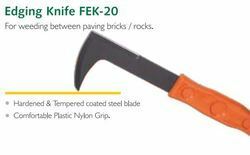 Edging Knife FEK-20 For weeding between paving bricks / rocks. — • Hardened & Tempered coated steel blade • Comfortable Plastic Nylon Grip. 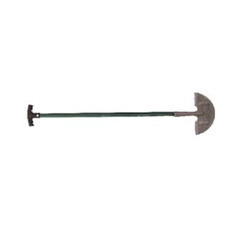 The Garden Tools utilized for gardening purposes are developed using graded carbon steel in compliance with the quality standards laid down by the agriculture domain. Designed for weeding between paving bricks and rocks. For weeding between pawing bricks I rocks. • Comfortable Plastic Nylon Gnp. Edging knife with stainless steel blade with wooden handle for user comfort.